Economical pressure transducer for monitoring fluid level inside a tank where there is no external mounting point at the bottom of the tank. Measure liquid contents of tanks with heights from 0.5 metres (1.64 feet) to 10 metres (32.8 feet) high. Choose between a low powered millivolt output, 0.5 to 4.5 vdc signal or a process control 4-20mA current loop signal. The IMTG is a low cost design for large quantity OEM requirements where it will be used as part of a tank contents monitoring system. For remote installations a strain gauge millivolt output signal can be specified which consumes relatively small amounts of power. For vehicle and automotive applications a standard ratio-metric or regulated 0.5 to 4.5 volt signal is available. For process plants and other industrial sites a robust 4 to 20 milliamp output option which can be transmitted over long distances is provided. 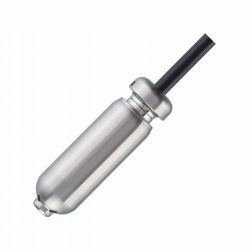 The sensor is manufactured using materials which are compatible with water, oil or fuel and a choice of cable coatings are available to ensure compatibility with different types of liquid. 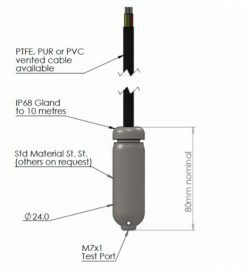 A liquid tight seal for the cable is supplied as standard for installing the sensor inside the tank. This is particularly convenient for tanks which are below ground level without any access to the bottom of the tank. Measure the level of a underground diesel tank to a depth of 3.5 metres. Monitor the level of diesel fuel tanks used on mobile heating & cooling systems installed outdoors for events, marquees and other temporary buildings. does the actual dimensions of the tank need to be defined for the sensor? The output of the sensor is fixed, so the maximum required range needs to be defined when ordering the sensor. Bear in mind the sensor measures pressure and therefore the level is determined indirectly. A 3 metre height level of diesel will measure less pressure than 3metre of water, so be careful to take this into account when specifying a range in mH2O units. The sensor can be custom scaled to any fluid type, so if you know the density or specific gravity of the fluid compared to water, you can calculate the required pressure range from the tank height. Instead of adjusting the sensor output signal, it is often easier to adjust the connected instrumentation; e.g. 4.04…19.6 mA for 0…100% full scale. If you are not sure of the exact density, then it is best to allow for the highest likely density, so if it is less the sensor will still be able to measure the pressure when the tanks is full. We are looking for the solution to measure the tank level of an emergency back up diesel generator for the day and bulk tank. The output of the sensor should be 4 – 20 milli-amp and the system should be installed in the existing tank with out any significant mechanical work. Is there a cost effective solution for the above mentioned application? The IMTG is designed for low cost application such as measuring the level of diesel fuel on a backup diesel generator. Why are there housing options for the IMTG in Delrin or PVDF, could you briefly explain the advantages of these over the standard SS303 housing, since the diaphragm is still SS316L? These non-metal housings were introduced to sure earthing issues in tanks with a poor earth installation. If st/st housings are supplied to remote diesel tank monitoring sites where the system has been earthed to the tanks, but the tanks are not connected to an earth rod, the sensor outputs become unstable if they touch the walls of the tank due to earth loops. Therefore the plastic housings prevent interference generated by a poor earth passing to the sensor electronics. We have a project for which we have to provide level sensors for remote monitoring of level in stationary diesel oil tanks. We are also offering solar system with this solution so the sensor must have a low power consumption and be able to measure the fuel level in the tank and output the tank level as a volt signal. The sensor will need to operate from a 5Vdc power input. The height of the diesel tanks is 1900 mm. 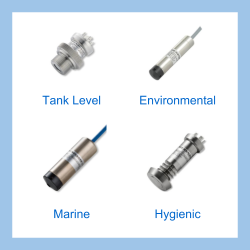 Please select the options you require for the IMTG Low Cost OEM Submersible Tank Gauging Level Sensor in your application and request a quote. Send us your enquiry for IMTG Low Cost OEM Submersible Tank Gauging Level Sensor to get assistance with this product type.